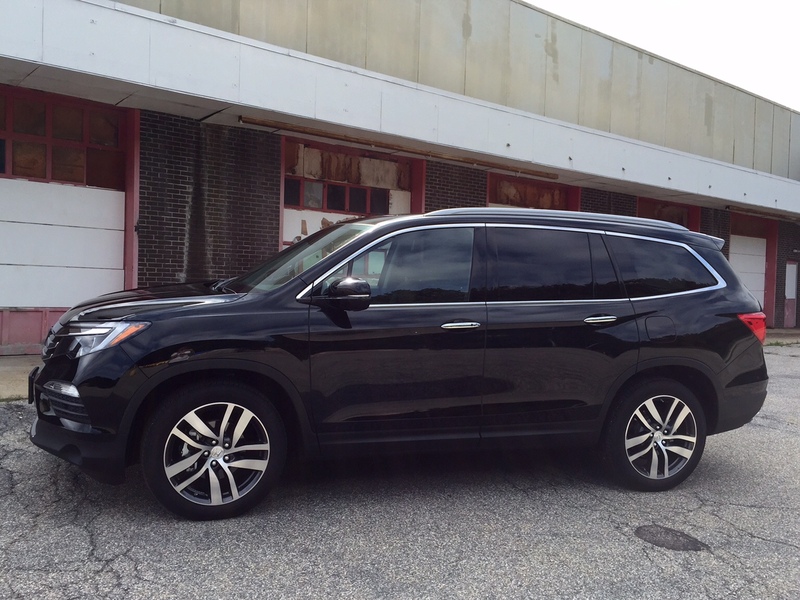 The Honda Pilot has been around since 2003 and for most of its life it has been a boxy, mid-size SUV. This worked when it was introduced, but with the crossover craze that styling became old and dated. Honda has fixed that problem with an all-new Pilot for 2016. There isn’t much that hasn’t changed on the new Pilot. Its looks are entirely new, leaning more toward the CR-V and Odyssey with lots of curves. The dated, boxy look of the prior generation is completely gone. This new Pilot looks good. It’s modern and sleek and manages to turn heads. This is a three-row SUV that looks so good people stop you in the parking lot at Target to ask about it while you’re out shopping with the kids. When was the last time the Pilot managed that feat? That newly updated exterior is nearly shown up by how good it looks on the inside. The prior Pilot, even in its most luxe trim, did not feel like a luxury car. The new Pilot takes some cues from its Acura siblings and boasts a stellar interior that assures every member of the family will be comfortable and entertained. There is seating for up to eight passengers with the AWD Elite we tested featuring seating for seven with second-row captain’s chairs. This makes getting to the now roomier third row easier and actually possible for more nimble adults. The grandparents won’t be sitting back there, but it’s no longer solely the territory of young kids. There’s enough head and legroom for adults and there are even cup holders that are also illuminated in the first two rows. The seating is very nice with a 10-way power driver’s seat and 4-way front passenger seat that are comfortable without being soft. There’s plenty of support without becoming stiff and minimal bolstering so those with wider frames won’t feel squished. 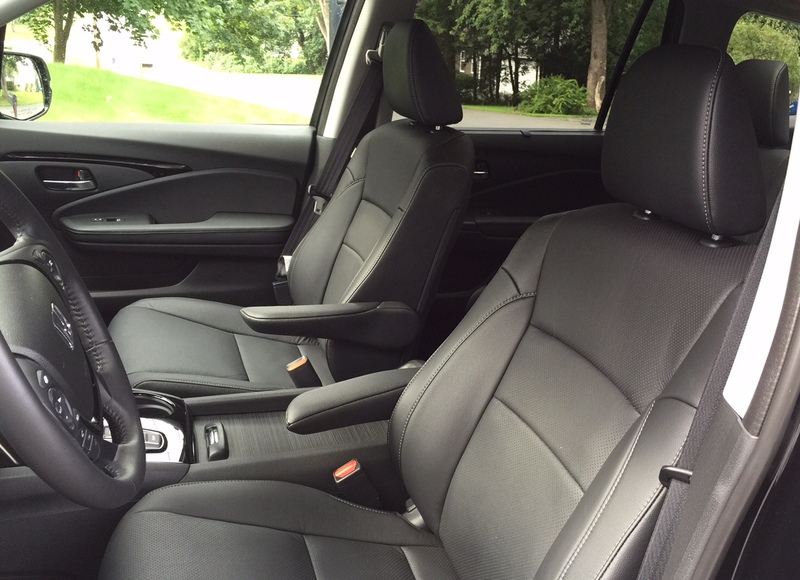 Front seats are heated and cooled while second-row seats are only heated. There is tri-zone climate control so keeping everyone at the right temperature in such a large space is easy. 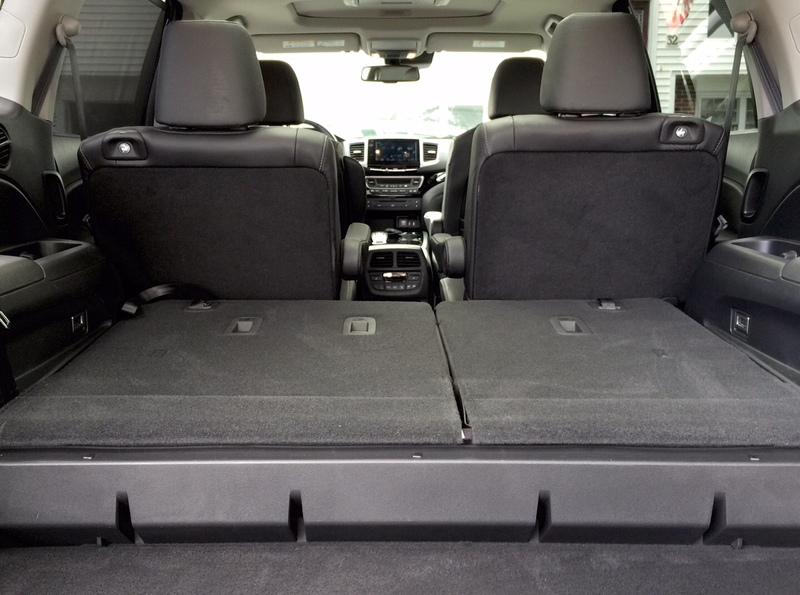 There’s plenty of room for cargo with 18.0 cubic feet of space behind the third row. This will hold an 82-quart cooler should the need arise. You won’t be doing that often, but it’s plenty of room to hold groceries or the kids’ schoolbags and random sports gear. Fold the third row and there is 55 cubic feet of space. Fold the second row, too and there is 108.5 cubic feet of room. 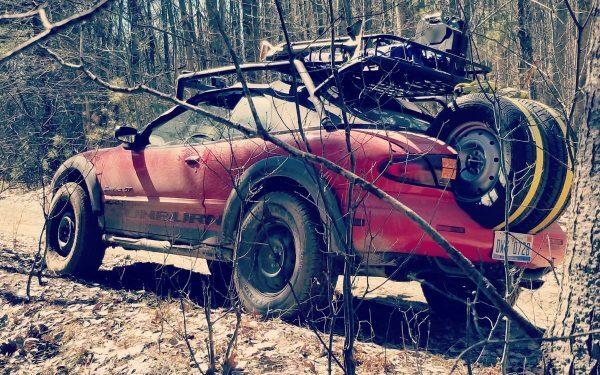 It can also tow 5,000 pounds. Whether it’s people or cargo, the Pilot has got you covered. 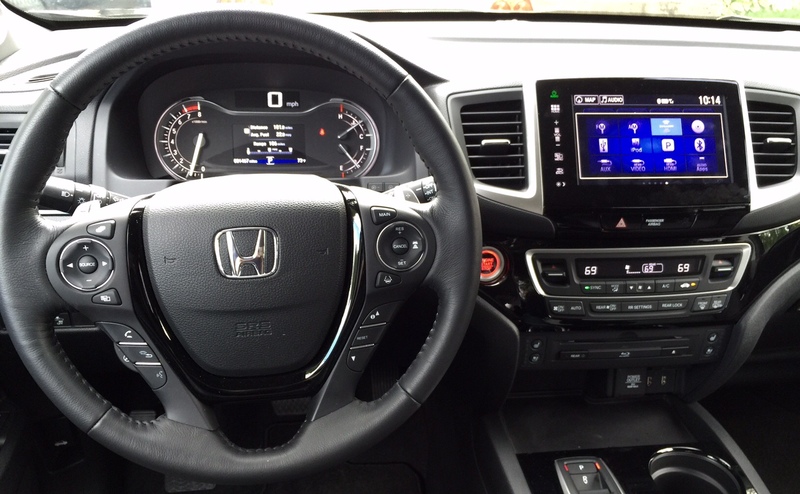 The infotainment system features an 8″ touchscreen which looks great until you touch the screen. It’s very shiny, which means even the cleanest of fingers leave smears that make it look like you were eating fried chicken on the road. If the sun hits that finger-smeared screen it’s even worse and you can’t see the display at all. A small gripe, but one that proved frustrating to both driver and passenger alike. Infotainment includes AM/FM/CD/HD with a 10-speaker audio system and there’s a 9″ rear Blu-Ray/DVD player with remote. It can be controlled from up front, or the kids can fight over the remote and control things from the back. It’s easy to use with a sturdy flip-down screen that doesn’t feel like it will easily snap when little hands inevitably use it to hold on when entering and exiting the car. A number of advanced safety features are included along with the usual assortment of airbags. There are anti-lock brakes, electronic brake distribution, tire pressure monitoring system, collision mitigation braking, adaptive cruise control, lane keep assist, forward collision warning, lane departure warning, and road departure mitigation. 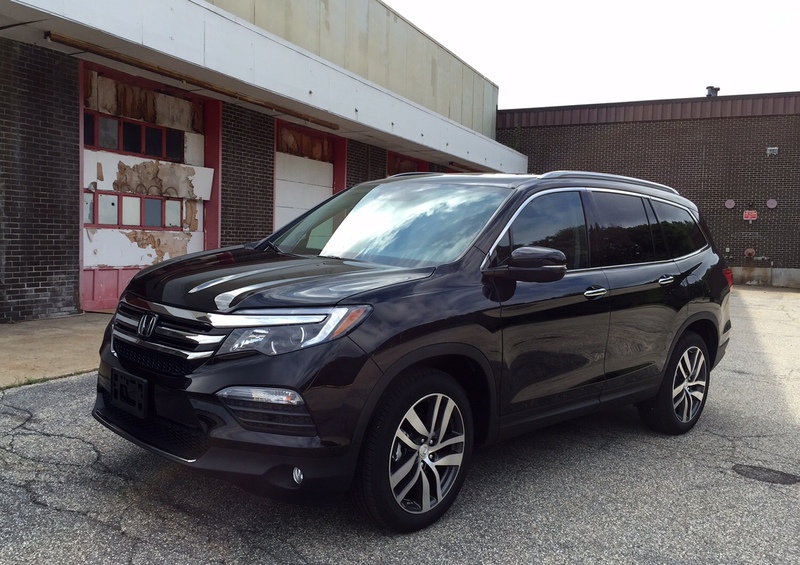 The 2016 Honda Pilot is powered by a 3.5-liter V6 engine with 280 horsepower paired to a 9-speed automatic transmission. There are also paddle shifters for those who want a little more control over their ride. The transmission was generally smooth, but occasionally it felt as though it was hanging on when it tried to decide on the next gear. There were also a few surges when it shifted too far down for a lower gear. 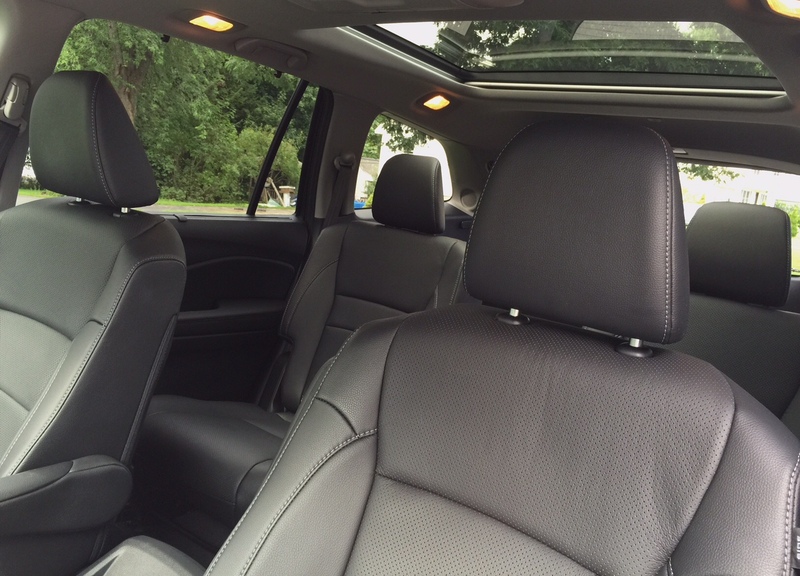 The ride is about as smooth as you’ll find in a mid-size SUV. This is a large vehicle, but it manages to keep from feeling truck-like with relaxed steering and good cornering. Bumps and dips in the road are smoothed out giving even those in the third row a smooth ride. It was composed and controlled even with abrupt maneuvers at highway speeds. There are drive modes of normal, snow, mud, or sand which the driver can choose depending on road conditions. Combined with AWD and 7.3 inches of ground clearance, the cold-weather months will be a lot easier to manage. 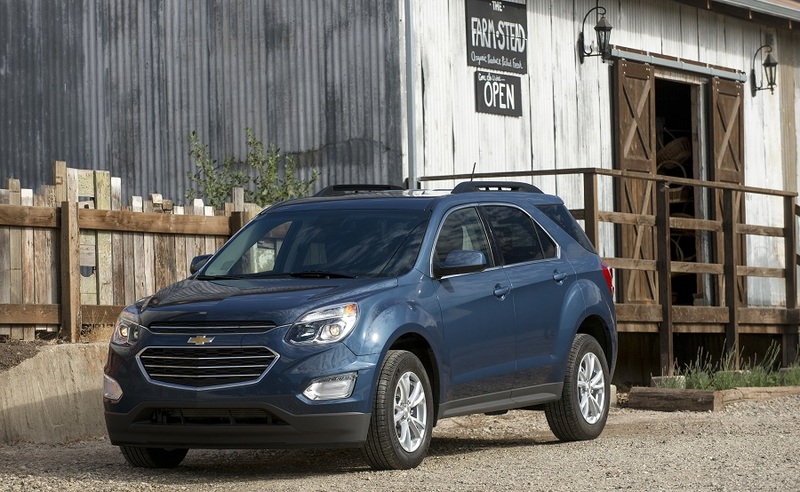 It also has good fuel economy of 19/26/22 mpg city/highway/combined. 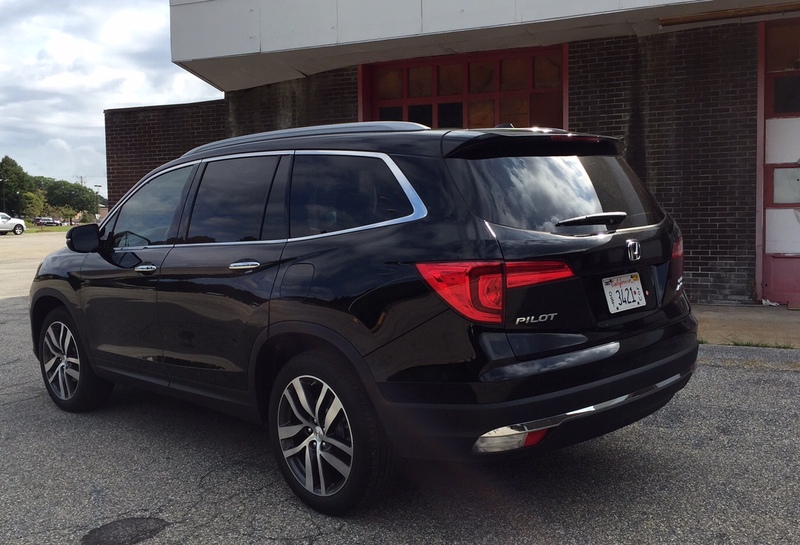 The all-new 2016 Honda Pilot is a greatly improved vehicle compared to its predecessor. Exterior styling brings it more in line with the rest of the Honda range and makes it more appealing while a well-designed comfortable interior make it someplace the whole family will enjoy.